He’s going big-time, branching out with a second I Love New York Deli. In addition to all the delectables he’s been dispensing at the Market, he’ll offer a complete line of smoked fish imported from Homarus/Marshall in Brooklyn (belly lox! kippered salmon! smoked sable! ), a dedicated deli case filled with kosher meats from Brooklyn’s own Empire National, plus kugels, kasha varnishkes, stuffed cabbage, rugalach, egg creams and Chock full ‘o Nuts (the “heavenly coffee“). Did I mention 50 seats and 20 parking slots? So, where’s it gonna be? Why should I tell you when you can get it straight from the horse’s mouth? Heeeeeeeer’s Jon-ny. “I’m on cloud nine! I haven’t slept in three days!” he says, having just signed the lease on the Continental Store European Delicatessen which relocated to 5200 Roosevelt Way N.E. several years ago — half a block north of the original. The Continental (not to be confused with the nearby Greek joint) has been U-District staple for a half-century. Ingrid Lechtenberg, who’s owned the place for a decade, sold her last bratwurst yesterday. “I’m 75. I’m retiring,” Ingrid said by phone this morning. “She sold me everything,” notes Jon. From the inventory and the “German tchotckes” (to be donated to the local food bank and to Temple Beth Am, respectively) to the almost-new equipment — for which he can’t believe his good luck. He expects to reopen in two weeks, running both businesses with the help of his bride of 38 years. “Lorraine will be at the Market on weekends. 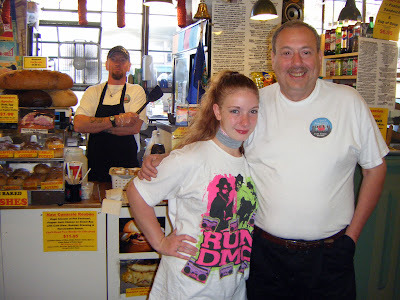 I’ll split my time, doing lunch at the Market, morning and late afternoon at the other store” — to be open daily from 6 a.m. to 6 p.m.
Jon, posing with Brooklyn. That’s Anthony (“Ant-ny” to youse) behind the counter. 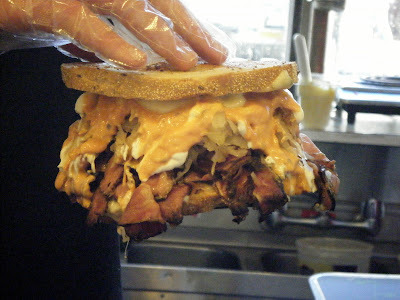 And with reubens like this one, who can blame him? 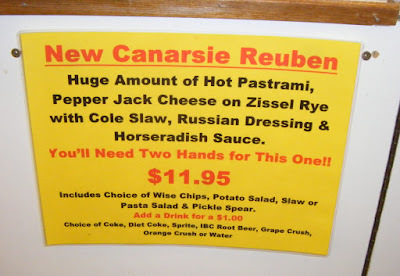 I Love New York Deli’s “New Canarsie Reuben” on zissel rye. $11.95 and food enough for two? Such a deal!